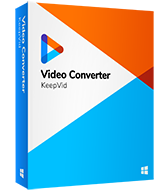 KeepVid Video Converter is a helpful video converter program for Windows and Mac users. It enables you to convert videos to more than 1000 video and audio formats. The program also helps you to edit and download videos easily. With the help of KeepVid Video Converter, you can trim video, add subtitles to videos and so on. The downloading feature enables you to download videos from more than 10,000 video sharing sites. In this part, we're going to introduce how to convert MP3 to WAV by using KeepVid Video Converter. · Download videos from more than 10,000 video sharing sites. · Convert videos with 30X faster converting speed. Step 2. Choose WAV as the output format, and click the Convert button to start converting MP3 to WAV. Step 3. When conversion finishes, you’ll get the converted file in Converted tab. 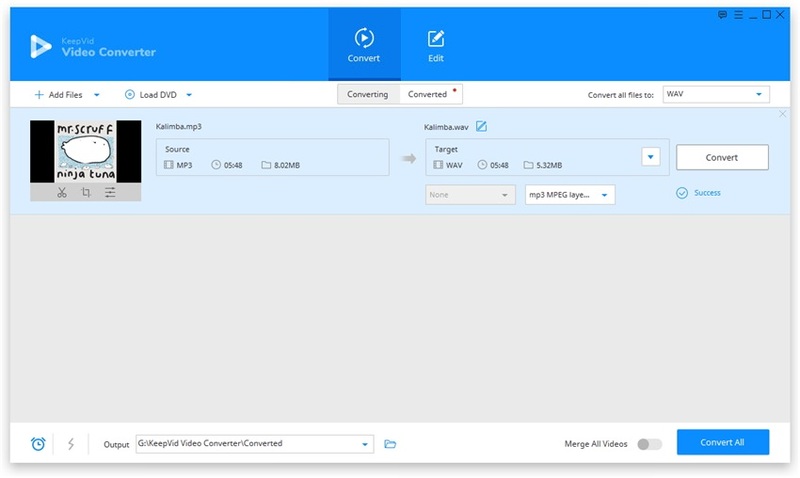 Run KeepVid Video Converter after the installation, and then select the Convert section at the top middle of the main interface. In this section, click the Add File or Add Folder button to add MP3 file from your computer. After loading the MP3 files in the program window, the software will show you the detailed information of the MP3 file. Now you can click the inverted triangle at the right side of the Target area, and select WAV as an output in the pop-up window. You can also click the inverted triangle icon beside the Convert all files to button, and select WAV as the output format. After that, click the Convert button to start converting MP3 to WAV. Then program will show you the process of the conversion. When the conversion finishes, you can go to the Converted tab, and locate the converted WAV file. Also, you can right-click the file and choose Open File Location to find the converted video in your computer. With the help of KeepVid Video Converter, you can also convert WAV to MP3 with a very easy process. Moreover, this converter enables you to convert many other helpful formats asl well. • Instead of adding files to the program one by one, you can use the Add Folder option to add multiple files in one time. • Before conversion, please take a look at the quality and size of the output file. At times, the output file will have larger size than lower quality of the original file. • If you want to edit videos before converting it, just move your mouse to the thumbnail of the video, and you’ll see the edit options. In this part, we're going to introduce you the top MP3 to WAV online and desktop video converters. KeepVid Online Video Converter is an online MP3 to WAV converter website which enables you to convert video and audio files online without installing any software. KeepVid online video converter is a totally free online video converter and it supports 50 audio and video formats for conversion. 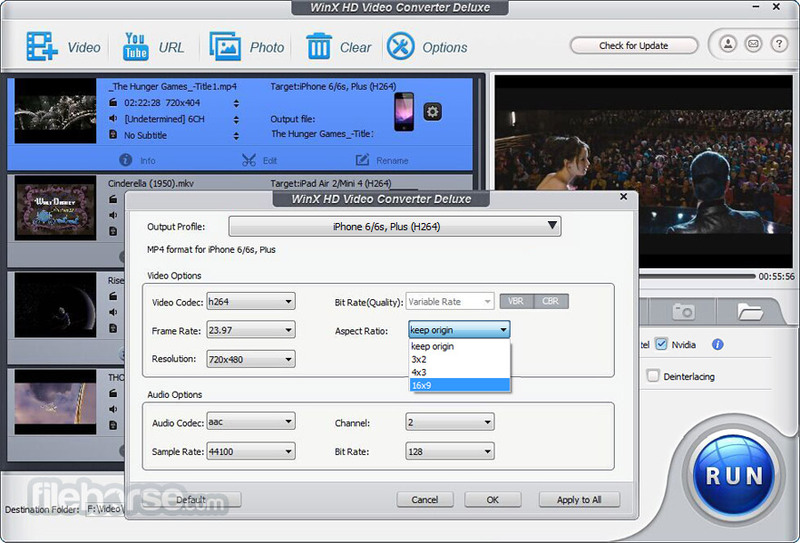 Super Video Converter is free video converter software available there for Mac and Windows users for free of cost. With the help of this software, you can convert your files to up to 50 video and audio file formats, but as input it can recognize mostly all formats. So you quickly convert videos to the most common formats. FileZigZag is a very decent online video converter website just like KeepVid online video converter. You can even convert video, audio, documents using this website. This website supports a number of formats, and it has a competitive fast speed for conversion. The limit of this online video converter is that you can only convert files no larger than 180MB. These above are the most powerful video converter programs and websites available over the Internet for all users. If you are really looking for a perfect converter then we hope your search is ended in this article and you have found what you are looking for. 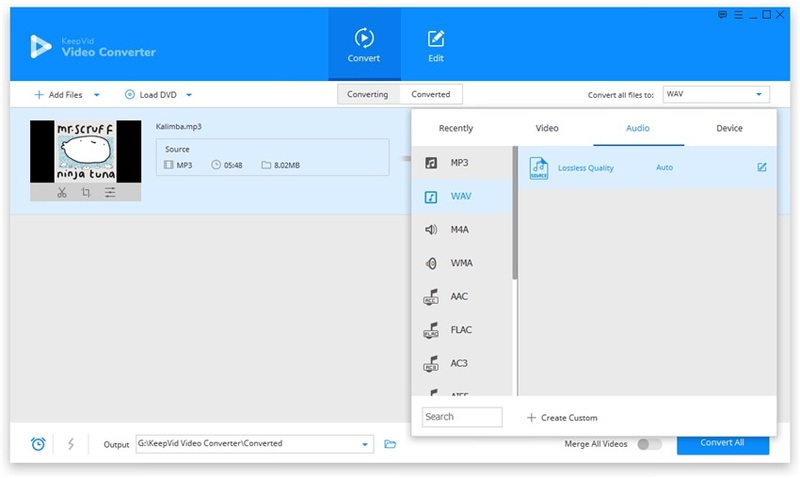 KeepVid Video Converter brings you several helpful and handy features to convert video and audio files, and it can be regarded as the best MP3 to WAV converter program.